This blog will be analyzing the movement of the markets based on cycles, technical analysis, Gann theory, Fibonacci numbers and math. 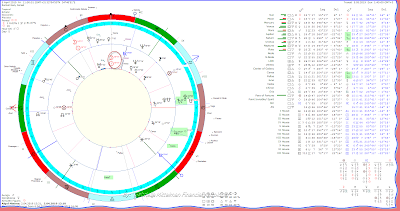 Market timing and changes in trend are aided by an astrological assessment of planetary positions. New Moon in Aries, 2019 ~ Financial and Mundane Astrology. Disclaimer and Nondisclosure: This blog is for informational purposes only. Gabriella Mittelman is not a licensed broker, and is not rendering any trading advice. Past forecasting accuracy is not indicative of future forecasting results or trading profits. This blog contains information and trade secrets based on Numerology, astrology, Gann etc. research of Gabriella Mittelman. The purpose of this blog is to inform and report, not to mislead. It is for your own personal use only. Although my astrological methods have proved have a high degree of reliability in the past, there cannot be, and you know there is no guarantee that they will continue to work in the future. Therefore, you are responsible for your own activities in the stock or commodity markets. Any such activity is solely your own responsibility if you choose to be active in the markets and you realize that trading involves high risk of loss of capital.